The manufacturing cycle remains strong. Even with the recent spell of bad weather, measures like Industrial Production, New Orders and the Purchasing Managers’ Index are all looking relatively good. One manner in which these will manifest themselves into stronger growth is through business investment in new plants and equipment. Currently U.S. corporate profits are at a record high both in terms of dollar value and as a share of the economy. Large profits and liquid assets on corporate balance sheets indicate firms are not investing much and this potential source of stronger economic growth is on the sidelines. One likely reason this has been the case is that these firms do not need to invest if they are not already using their existing facilities (including employees) at full capacity. As measured by the Federal Reserve, industrial production and capacity utilization are either back, or nearly back, to pre-recession levels in aggregate. What these aggregate trends miss are the more granular details by industry, something Bill Conerly advised us recently to examine in a Governor’s Council meeting. Overall, does this mean the U.S. economy is running into some supply constraints and should business investment pick up in the near future as demand increases? Fortunately, the likely answers are yes, and yes. 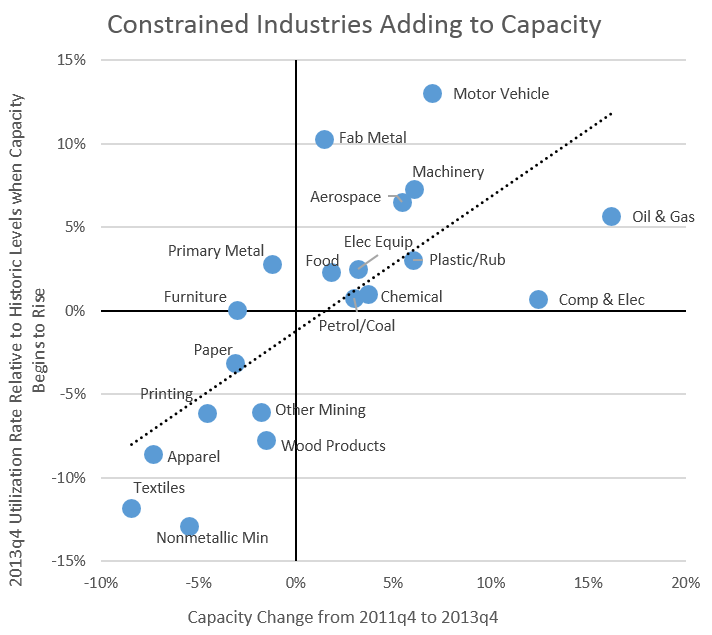 First, which industries are at least potentially capacity constrained? I examined each of the major sub-sectors since 1980 to gauge at what capacity utilization rate each industry typically began increasing capacity, then looked to see where that industry is today relative to this constrained level of utilization. See the Addendum at the end for more details. 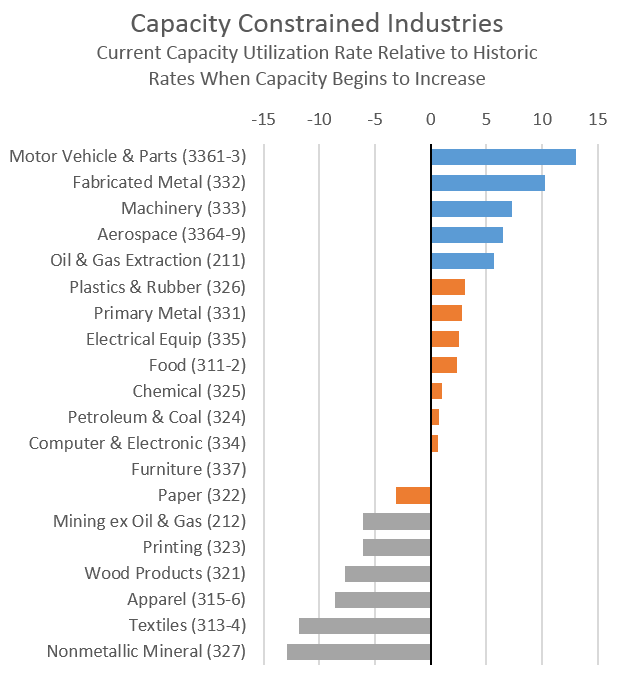 Now, in which industries have we seen actual capacity increase? Just as recession and recovery have been uneven across industries, so too has investment and capacity growth, but by and large, those industries that are constrained are increasing capacity. Note that the vertical axis in the scatter plot is the same as the bar graph above. This is good news for the economic outlook as production levels are beginning to reach expansion levels in many of the industries. We’re seeing a supply response in over half of the industries, and outside of Oil & Gas and Computer & Electronics this increase in investment and capacity should continue as demand grows . To date, these increases in capacity appear to be mostly incremental, leaving more room for growth moving forward. This is particularly in the cases of the Chemicals, Fabricated Metals, Food, Plastics & Rubber and Primary Metals industries. Many of these industries can be considered “newly constrained” meaning they are either just around the breaking point in terms of new investment or just reached this level within the past year or so. The two industries that have increased production (and employment) considerably but have yet to add much to capacity are fabricated and primary metal producers. Should demand for these industries’ products continue to grow, a supply response is likely in the near future. Similarly, many of these “newly constrained” industries should be the main beneficiaries of cheaper energy costs. driven by both increased domestic production and ebbing global prices. While energy intensity is not what it once was, and as energy costs do not make up too large a share of production costs for firms, it should still help, at the very least on the margins. As for the industries in the lower left hand quadrant, many of these are in longer run structural declines . The industrial production data point to tightening conditions across most industries, but the real question becomes whether or not this next round of investment and expansion will occur in the U.S. In recent years, the tendency has been for increased U.S. demand to be satisfied by increased imports. Domestic industrial capacity did not expand much during the 2000s, as many investments were made overseas. Should this investment pattern continue, the larger manufacturing recovery will have a muted impact on overall U.S. growth. Thankfully there are a number of reasons to suspect that this time is different. In particular the costs of doing business — namely exchange rates, labor costs and energy costs — are all working in the U.S.’ favor, at least more than they did a decade ago. As some other researchers have noted — Goldman Sachs among them — these advantages may not result in the so-called manufacturing renaissance others have hoped for or even expected. This is true. Typically manufacturers will first look for productivity enhancements before hiring or expanding domestic facilities. However, in a relative sense, it is not unreasonable to expect industrial production and capacity to increase in the coming decade at a better rate than last decade. Growth may not reach the 5%+ growth of the 1990s, but we are already matching the 2.5% growth seen during the 2000s. Conclusion: Given that the “newly constrained” industries are likely to undergo an expansion in the near future, and provided that expansion happens in the U.S., industrial production and business investment should accelerate in 2014 and 2015. This acceleration in production activity could easily add an additional one half of one percent to GDP growth as well. Seeing corprations and firms reinvest their profits instead of largely leaving them on the sideline will further reinforce the economic expansion, helping provide growth above the lackluster rates seen so far in recovery. Note 1: Big investments and capital expenditures have been made in natural gas and in oil in recent years, adding to capacity. A slowdown in these investments may be in the works, for this reason alone. As for Computer & Electronics, as we know here in Oregon with Intel, the industry has undertaken a massive expansion in both capacity and new technology in the past couple of years, even as the PC market’s fortunes have waned. Given investment cycles take years, this industry is unlikely to increase capacity too much further in the near future and may already be trying to rein some of the increases back in, at least until market conditions improve. Note 2: Industries such as apparel, paper, printing, textiles and possibly furniture, are in more long-run structural declines in terms of domestic production and capacity. These industries — broadly speaking — have not fared well in the past 10-15 years and may not moving forward either. However, other mining activities and wood products are more likely to bounce back. In consultation with our advisors, there is likely to be some new investment in wood products in the near future, although it will likely be concentrated in the South and not the Pacific Northwest. Addendum: When are industries constrained? 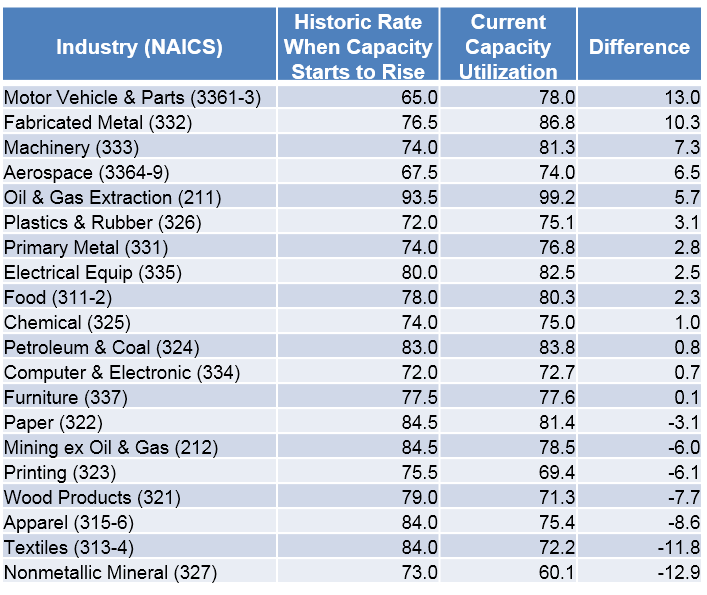 Using the author’s estimates I went and examined each of the major sub-sectors since 1980 to gauge at what capacity utilization rate did that industry begin raising capacity itself. I did this a few times and averaged the estimates. Thankfully for most industries the answer each time was the same or very close. Additionally, for many of the industries the answer did not change much over the past 30 years. Even still, these are just one person’s estimates and yours may vary somewhat but this general pattern should still be present.